The Bolshoi Theater in Moscow. The Bolshoi’s new season will see Anna Netrebko and Dmitri Hvorostovsky perform in the theater’s own productions for the first time, while the opera premieres include David Alden’s staging of Benjamin Britten’s “Billy Budd” with the English National Opera. 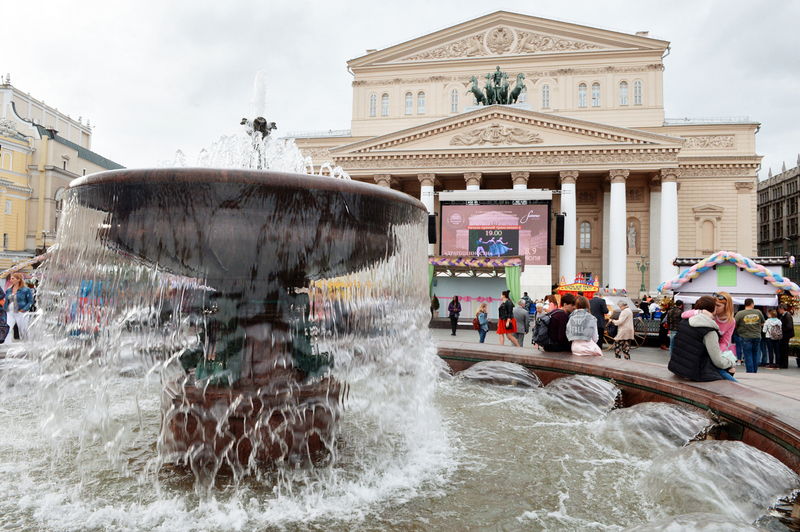 The Bolshoi Theater has announced the premieres and guest star performers that will grace its new season – including “debuts” at the theater for two of opera’s greatest names. The parade of opera premieres at the Bolshoi Theater will open on Oct. 16 with Manon Lescaut on the Historic Stage. The Puccini opera will be staged by director Adolf Shapiro. The conductor's stand will be taken by Italian maestro Jader Bignamini, while the title part will be performed by Anna Netrebko. It is the first time that she will take part in one of the theater’s productions, so for the famous diva it will be a kind of debut at the Bolshoi, said general director Vladimir Urin, adding that such "debuts" are also planned for other opera stars in the upcoming season. For example, the December performances of the opera Don Carlos will star Dmitri Hvorostovsky. "The contract has been already signed," confirmed Urin. Among the other star debutants, he also cited Hibla Gerzmava, Ildar Abdrazakov, Olga Peretyatko and Ekaterina Gubanova, who will also be taking part in Bolshoi productions for the first time. The next opera premiere will take place on Nov. 25 on the New Stage. It will be Benjamin Britten’s Billy Budd, which will be a co-production with the English National Opera. It will be staged by one of its most renowned opera directors – David Alden, with William Lacey as the conductor. Urin named the 90th anniversary of the legendary choreographer Yuri Grigorovich as the main event of the new season for the Bolshoi’s ballet troupe. "Grigorovich is an era, and not only for the Bolshoi, but also for the world of ballet," he said. The celebration of the choreographer will last throughout January and February 2017, when the Bolshoi will host a festival of Grigorovich's performances. Currently, the repertoire includes 10 ballets by the choreographer, to which The Golden Age will be added in the new season. In July, toward the close of the season, the Bolshoi has plans to present an original ballet tentatively called Nureyev. It is being composed by the same team that created last year's A Hero of Our Time – composer Ilya Demutsky, librettist, director and set designer Kirill Serebrennikov, as well as choreographer and the libretto's co-author Yury Possokhov. In March 2017, the opera company, choir and orchestra will visit Switzerland and France. Meanwhile, the ballet will be performing from May 31 to June 19 in Japan, where it will show Swan Lake, Giselle and Flames of Paris. In July, the ballet troupe will travel to New York with Jewels and The Taming of the Shrew. Almost in the same period, the Bolshoi opera company will take part in the International Festival in Savonlinna, Finland, where it will perform Iolanta and Eugene Onegin.